"Visual Enhancement Through Custom Fabrication"
Our staff has the ability, facility and capacity to handle almost any project. It is our innovation, high standards of themed design and construction, quality and dedication to our customers that makes Artistic Contractors the ideal fabrication partner. Other companies promise full service - WE DELIVER IT! 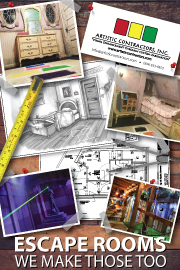 We invite potential clients to visit our facilities and experience Artistic Contractors for themselves. Bring your imagination to us!